Electronics and computer is one of my hobbies, I remember; I was so fascinated with the amateur radio transmitter and decided to build my own first single transistor transmitter. The thrill of listening to my own voice transmitted over the sort wave radio frequency is bring me to this hobby ever since. Although I am not participating with the amateur radio organization anymore but I’ve learned a lot from them especially the spirit of experimenting and sharing the knowledge. For example some of the funny experiment I’ve done many-many years ago with my friend was to increase the power of my transmitter; you know sometimes we didn’t fully understand the way this electronics with all the inductors works; so I decided to put a power tube (807) for my new transmitter after playing with this transmitter for a while; suddenly one of my neighbor came knocking the door and yelling at me “Hey… we all can hear your voice…, you just need to show your picture on our television !”. 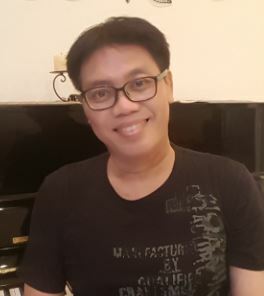 After asked for apologize and many changes both in inductor filters and transmitter antenna, finally I could transmit my voice over 200 miles distance. The development of today’s modern electronics actually is started when Guglielmo Marconi on year 1901 transmit the first radio wave across the Atlantic Ocean. This experiment is then become one of the most important achievement in human history as the first long range wireless communication form. 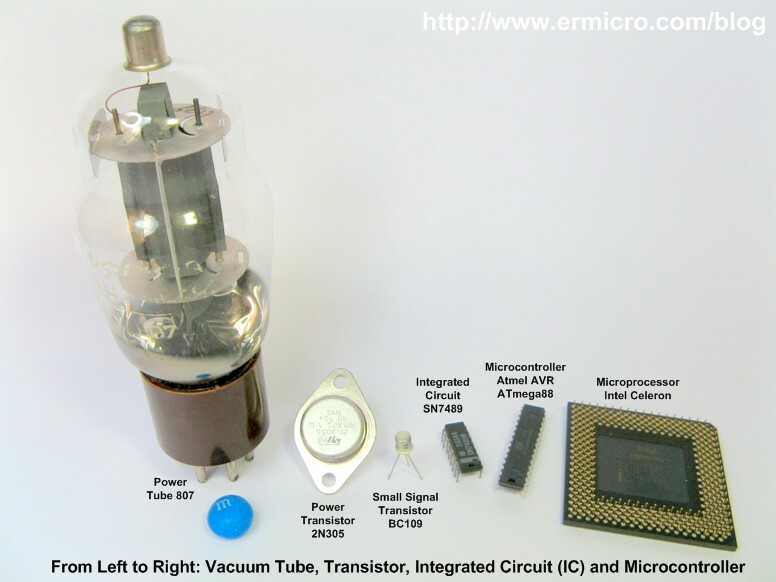 Since that, the electronics development has been evolved significantly from big vacuum tube to the sophisticated microprocessor and microcontroller which contain million of transistors in one chip. Today’s microcontroller is become essential part in our life; where ever we go; whether we realize it or not we always use this tiny computer that works silently inside our car (e.g. electric windows, anti-lock breaking system, automatic transmission) or our home appliances such as Microwave, Washing Machine, DVD, Television until our personal gadgets such as Mobile Phone, MPG3 player and many more. Born in the earliest 1900, the electronics knowledge is still very young and I think is one of the interesting and challenging knowledge to be learned; learning electronic require not just a good understanding about the electrical principals and how the electronic components work but it also depend heavily on the experiments and experiences in order to master it. 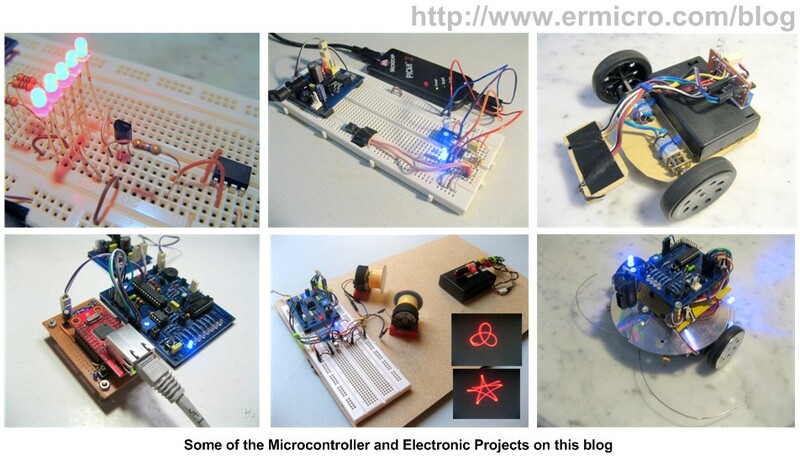 This blog is all about learning, experimenting and sharing the microcontroller and electronic knowledge that I’ve done, all of the projects in this blog is base on my own original experiments, therefore you will not find these experiments on the other websites. I believe that learning by doing is the best teacher for us, it doesn’t matter how long it will take to understand one subject but once we understand it the rest will be much easier for us to learn. I would welcome your comments or suggestions regarding this blog or its contents, please feel free to drop your comments on the articles or you could email to ermicroblog@gmail.com if you don’t want to publish your comments. So keep tunning on this blog, hope you enjoy.